Earlier this week, I found myself with a major case of insomnia. Hooray! And what better way to keep myself busy at 4 in the morning than to rewatch old episodes of Project Runway Season 2, right? While I love me some Mondo, Anthony, Seth Aaron and Korto, the first few seasons of the show will always hold a special place in my heart. "Ah, well," I thought to my sleep-deprived and slightly hallucinating self. "Thank goodness they've already started casting Season 9." So imagine my delight when Lifetime announced information not only on the premiere of Season 9, but also two new spin-off series that made my little heart patter. First of all, as I correctly pontificated, Project Runway Season 9 will premiere this summer. Casting is underway, and if you follow @ProjectRunway on Twitter, you'll get to see fun photos of some Runway alums helping out (so far Season 3's Laura Bennett and Season 5 winner Leanne Marshall). No word yet on whether Lifetime plans on sticking to the 90-minute format like last season. Even more exciting, though, is the development of Project Runway All-Stars! The spin-off will feature eight one-hour episodes pitting our favorites from past seasons against each other. After the wonderful success that was Bravo's Top Chef: All-Stars, I'm sure this will be a must-see for any Runway fan. I was a bit concerned that legal battles may have limited the crop to Season 6 and after, but a poll of "Which designers would you love to see compete again?" on Lifetime's blog lists plenty of designers from Seasons 1-5 (and, by the way, Mondo Guerra, Laura Bennett and Nick Verreos are in the lead). I'll post my dream cast list in the upcoming weeks. Also coming to a television near you is Project Accessory. According to the announcement, Project Accessory will "follow enterprising artists who will be put to the test to create the newest and hottest trends in accessories as they compete for a cash grand prize to help them launch their own fashion accessories business." I'm not jumping for joy at the thought of watching people put together bracelets and royal wedding hats (not to take away from the incredible skill required for those things, of course), but I'll most likely tune in and see how it goes. 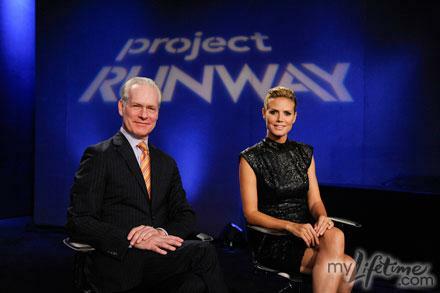 Which series are you most looking forward to: Project Runway Season 9, Project Runway All-Stars or Project Accessory? Which former designers do you want to come back? And do you want the original series to stick to the 90-minute format or return to one-hour episodes?